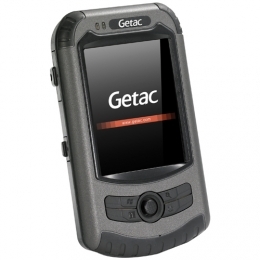 The PS535F from Getac is the epitome of robust data acquisition terminals it combines the powerful features of outdoor MDAs with a particularly compact housing conforming to military standards. In addition to it being the smallest handheld device of its class, it features all interfaces needed to ensure successful and reliable use in the field, in industry and logistics, and even in the worst temperature conditions. Equipped with a 533 MHz processor, 256 MB RAM and 2 GB flash memory, it provides the user with sufficient resources at all times. Its integrated SD card slot allows for extension of its memory up to 16 GB, through which such functionality makes even intensive data processing and storage of substantial data volume possible. Data entry is carried out in two possible ways either using the 8.9 cm 3.5 transflective TFT-LCD touch screen with 480x640 pixels resolution VGA, which is readable even in sunlight, or via programmable hot keys and 5-way navigation key. Furthermore, contactless data collection is achieved through the integrated 3 megapixel auto-focus camera for photos and 2D bar code scanning. The included Getac camera software tags capture images with precise GPS datum and compass information that allows for professional geotagging applications. The numerous interfaces integrated in this device tap its full performance potential with its high sensitivity GPS receiver, electronic compass with integrated altimeter and on-board Wi-Fi and Bluetooth interfaces, it is ideal for a large spectrum of applications. Wireless real-time data transmission is childs play with this miniature terminal. Thanks to Windows Mobile 6.5, integration into existing workflows is a matter of seconds. It also is unparalleled in terms of battery life - up to eight hours continuous operation are no problem at all, as it can be replaced easily anywhere, making the PS535F even more flexible. Almost unlimited usability of the PS535F in vehicles and more extreme conditions is ensured through extensive drop, shock and tumble tests. Numerous accessories expand the functionality and guarantee even more reliable operation of the terminal. Getac Battery, 10 pack - Spare battery for Getac PS535F, pack of 10pcs. Getac USB cable, 10 pack - USB Host cable for Getac PS535F, fits for Advanced and Flexible versions only, pack of 10 pcs.